LoRa click is a LoRa® RF technology based SRD transceiver, which operates at a sub-gigahertz frequency of 433/868MHz. This click board™ features an embedded LoRaWAN™ Class A compliant stack, providing a long-range spread spectrum communication, with high interference immunity. The LoRa module used on this Click board™ is fully certified LoRa Sub-GHz, 433/868 MHz European R&TTE directive assessed radio modem, which combined with the advanced and simple command interface, allows for an easy integration into the final application, reducing development time, costs, and time to market. Equipped with LoRaWAN Class A compliant stack, LoRa click offers an easy and reliable solution for developing low power, highly integrated LoRaWAN IoT networks, security systems, alarm networks, building control, M2M interfaces, and similar applications that require simple and reliable networking solutions. IT offers a programmable RF communication data rate up to 300 kbps with FSK modulation or 5468 bps with LoRa™ Technology modulation. The main active element of the LoRa click the RN2483, low-power long range LoRa® technology transceiver module, from Microchip. It features the Class A LoRaWAN compliant stack, optimized for a robust LoRaWAN networking, immune to interferences, and suitable for the long-range wireless operation. It offers a long-range spread spectrum communication with high interference immunity. A receiver with the sensitivity of -148dBm combined with the 14dBm integrated amplifier allows for extended range links that can achieve up to 15km in open area (by the module manufacturer specification). LoRa click offers data rates of 300 kbps with FSK modulation and 5468 bps with LoRa Technology modulation. The LoRaWAN network is sorted into three different classes. Class A compliant devices network is a network where end nodes are battery operated, the communication payload is small with longer intervals, and the communication is initiated by the end node (uplink). Communication is bidirectional, and the server responds in predetermined response windows. This is a system command that will put the module into a Sleep state for a period forwarded by the <length> parameter (in milliseconds). The module is also equipped with the non-volatile memory (EEPROM) for storing the configuration settings, as well as some additional data. The default UART communication speed is 57600 bps, 8N1 with no hardware flow control enabled. The break condition can be transmitted to the module if keeping its UART_RX pin low for a period longer than required to transmit a single character. This will interrupt the Sleep mode before the timer expires, also it can be used to sense the communication speed. After the break condition has been signaled to the module, sending character 0x55 will match the communication speed of the module with the speed at which the 0x55 character was sent. To join a LoRaWAN network, the device requires a LoRaWAN concentrator/gateway. The endpoint device has to use a unique endpoint address, an application session key, and network session key. The first method is called over-the-air activation (OTAA), where these keys are issued after a specific join procedure (more info can be found in the LoRaWAN specification). The second method is to assign these keys manually, using UART commands. This method is called activation by personalization (ABP) and can be prone to some security issues. In any case, before an end-device can communicate on the LoRaWAN network, it must be activated. The LoRaWAN MAC layer can also be suspended by a command, allowing simple p2p (peer-to-peer) communication, where two nodes directly communicate with each other. Although explanation of all the configuration parameters, as well as the in-depth explanation of each feature of the RN2483 module can be found in the Command Reference User's Guide, please note that improper settings of some parameters might render the device unresponsive. Therefore a care should be taken to read and understand the explanations before applying these settings. To simplify the design and avoid errors, MikroElektronika includes a Click board™ library, which contains simple functions used to set up and operate the LoRa click. The included demo application illustrates how to use them in a real application. It can be used as a reference for the custom design. To allow interfacing with both 3.3V and 5V MCUs, this click board™ employs the TXB0106, a bidirectional level shifter and voltage translator from Texas Instruments, supported by a 3.3V LDO. This translates the external voltage levels to acceptable levels that can be used on the LoRa module. All the used I/O pins of the module are routed via this IC to the mikroBUS™ pins. The UART RX and TX pins are routed to the appropriate mikroBUS™ UART pins, via the level shifter. CTS pin is routed to the INT pin of the mikroBUS™, while the RTS pin is routed to the CS pin of the mikroBUS™ - also via the level shifter. Those pins can be used when hardware flow control is required. The #RESET pin is routed to the mikroBUS™ RST pin and it is used to reset the device. It is internally pulled up with a resistor. 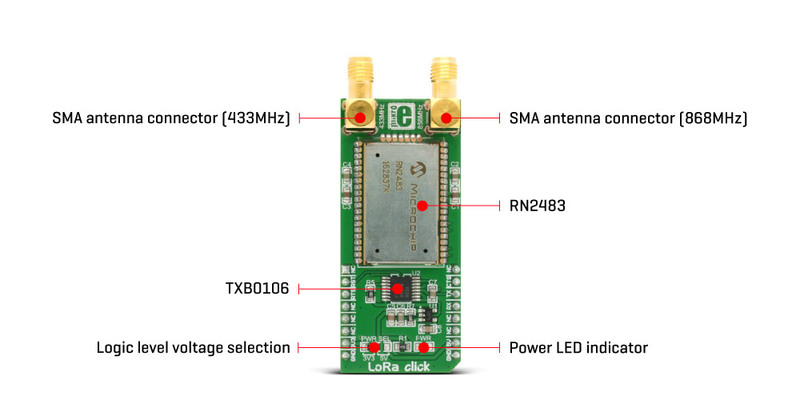 LoRa click board is equipped with two SMA connectors so it can be equipped with the appropriate 868MHz and 433MHz antennas - offering a choice of two communication frequencies that can be used. The onboard SMD jumper labeled as VCC SEL is used to select the voltage input for the level shifter for interfacing with 3.3V or 5V MCUs. This table shows how the pinout on LoRa click corresponds to the pinout on the mikroBUS™ socket (the latter shown in the two middle columns). We provide a library for LoRa click on our LibStock page, as well as a demo application (example), developed using MikroElektronika compilers and mikroSDK. The provided click library is mikroSDK standard compliant. The demo application can run on all the main MikroElektronika development boards. The full application code, and ready to use libraries can be found on our Libstock page.